Salvaged cobblestone paving material, refers to unused or unwanted paving that has value and can be reused, sold or traded. In today’s green building environment, designers, builders and homeowners are giving serious consideration to green, reclaimed, recycled, used and salvaged building materials that will promote sustainability and a more environmentally responsible living environment. Architect Bud Dietrich, in an article on the website HOUZZ, discussed the attributes of utilizing salvaged materials. “While it’s good to be green, it’s a plus when we craft something beautiful at the same time. The depth of color, patina and richness of salvaged materials are also design factors that can make our homes truly wonderful,” wrote Dietrich. We couldn’t agree more, and it’s why Monarch Stone International is proud of the quality found in the Historic European Cobblestone® collection. This is premium salvaged paving material second to none. 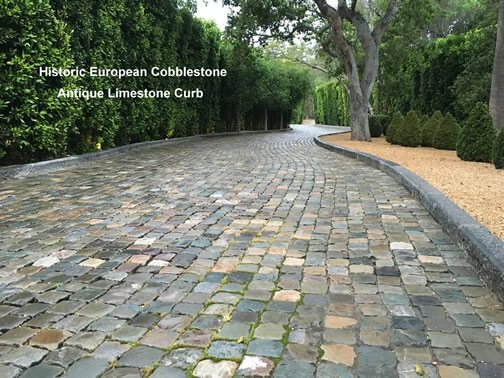 Authentic, antique reclaimed cobblestone and curb, with a rich patina and color so rarely found in recycled cobblestone and curb. In addition, the colors and size options in this collection offer more diversity than you’ll find from any other source. Salvaged cobblestone and curb is 100% natural material. Antique cobblestone and curb were not made with equipment that polluted the air, rather it was quarried and cut/trimmed by hand. Reclaimed granite or sandstone cobblestone has exceptional durability (already time and weather tested) with low to no maintenance. Cobblestone, when installed on a natural sand base, can be recycled again, re-used as many times as required. When installed on a natural sub-base with sand joints, or a mix of sand and permeable sand stabilizer, this will allow for permeability which reduces storm water run-off and aids in the reduction of pollutants and reduces erosion.